Light snow begins to fall in parts of Gush Etzion. Snow also expected in the northern Golan Heights. 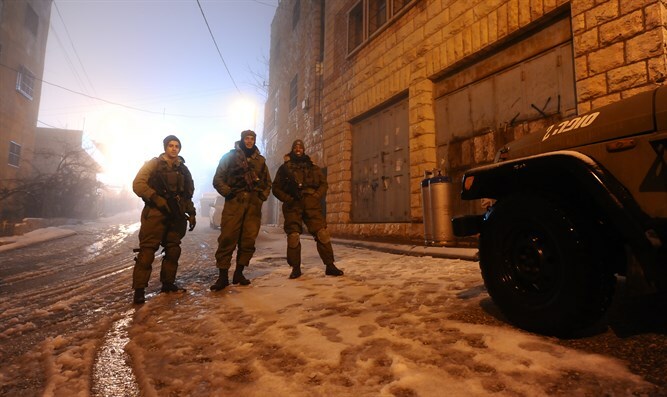 Light snow began to fall on Sunday evening in several communities in Gush Etzion. At this point the snow is not piling up and all the roads remain open to traffic. Israel will be dealing with wintery conditions in the coming days. Overnight Sunday, it will rain occasionally in the north and center of the country. The rain will be accompanied by thunderstorms and strong winds. It is expected to snow on Mount Hermon and in the northern Golan Heights. There is a fear of flooding in the Jordan Valley, the Judean Desert and the Dead Sea. It will be hazy in the south. On Monday, rain with occasional thunderstorms is expected in northern Israel. South-westerly winds will continue to blow along the coast and the mountains. In the south and center there may still be haze. It will continue to snow on the Hermon. It will be colder than usual. There is a fear of flooding in the north. On Tuesday, it will continue to rain in the north, and the rain will be accompanied by thunderstorms. In the afternoon the rain will spread to the center of the country and gradually grow stronger. Strong winds will blow through most parts of the country. In the south and center there may be haze. It will be cold. Snow is expected on Mount Hermon. At night, snow may fall on the peaks of the northern mountains. There will be still be a threat of flooding in the north. On Wednesday it will mostly cloudy. Light rain is expected to fall in the north and center of the country. It will continue to snow on Mount Hermon, and the winds will weaken. It will continue to be unusually cold for the season. On Thursday, it will be mostly clear. Temperatures will rise and will be normal for this time of year. In the early hours of the morning, easterly winds are expected in the mountains of the north and center.